Happy New Year’s…Again and Again! The most well-known new year celebration, especially in the Western world, takes place on January 1st. Although the first day of the year is a holiday in many places of the world, the real celebration takes place the evening before. 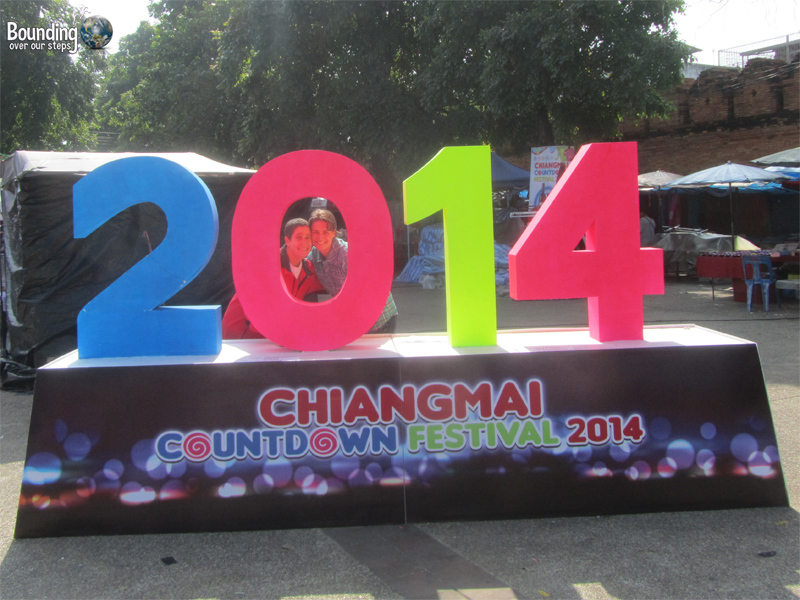 We enjoyed the New Year’s celebration that we are most familiar with in Chiang Mai, Thailand, watching the sky light up with amateur fireworks from all over the city. 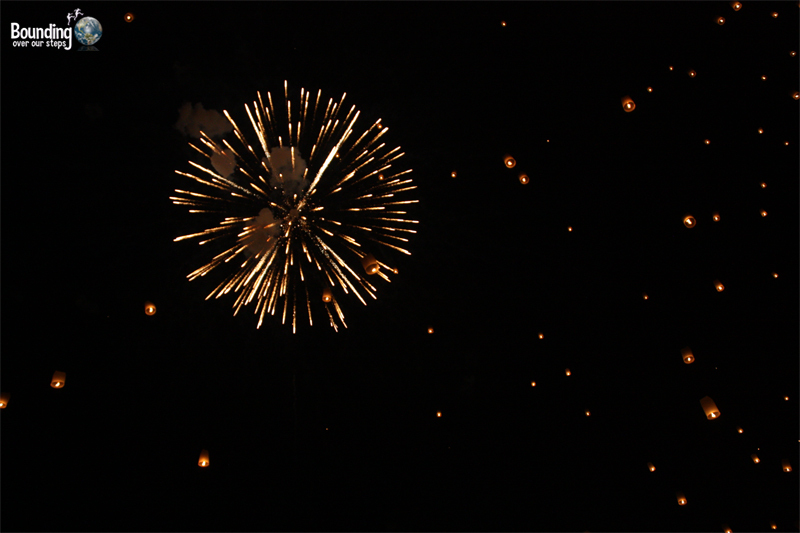 In a Thai twist there were traditional lanterns carrying wishes up to the sky as well. Not a bad way to begin our year of new years! One of the most widely-celebrated new years is the Chinese New Year, which occurs between late January and mid-February. Otherwise known as the Lunar New Year, the festivities last for two weeks, during which time about 20% of the world’s population spends time with family, gathers good luck and extends wishes of prosperity. Every year there are festivities in much of Asia, including our home base of Chiang Mai, where we were startled by fire crackers on numerous occasions walking to work. 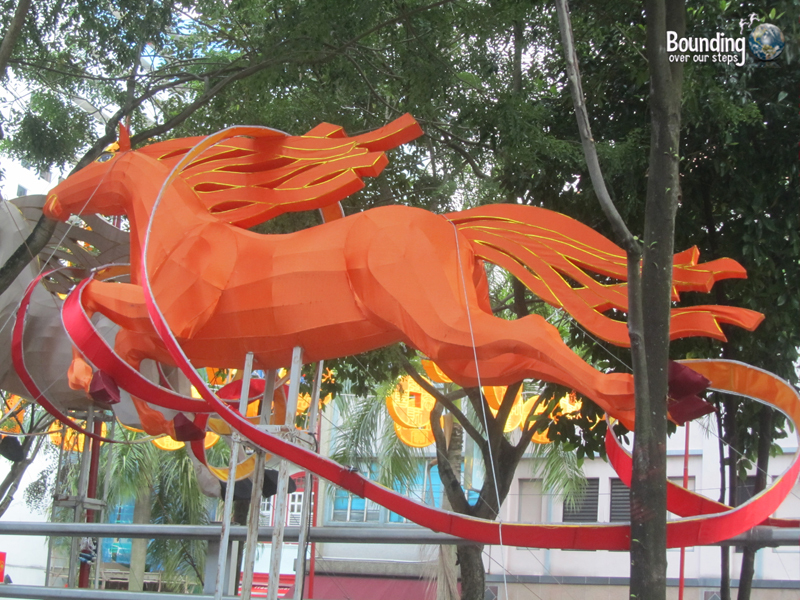 This year, however, I also found myself in Singapore for a few days during Chinese New Year. I was sad to learn from a taxi driver there, that because it was the year of the horse, the race track would see more people than usual. Only known to and celebrated by Bali residents, the Balinese New Year saw the smallest number of participants when compared to other new years events. However, in many ways this celebration was the biggest, most spectacular and we dare say our favorite of the lot. We felt so lucky that this incredibly unique festivity happened to coincide with our month-long trip to Indonesia. 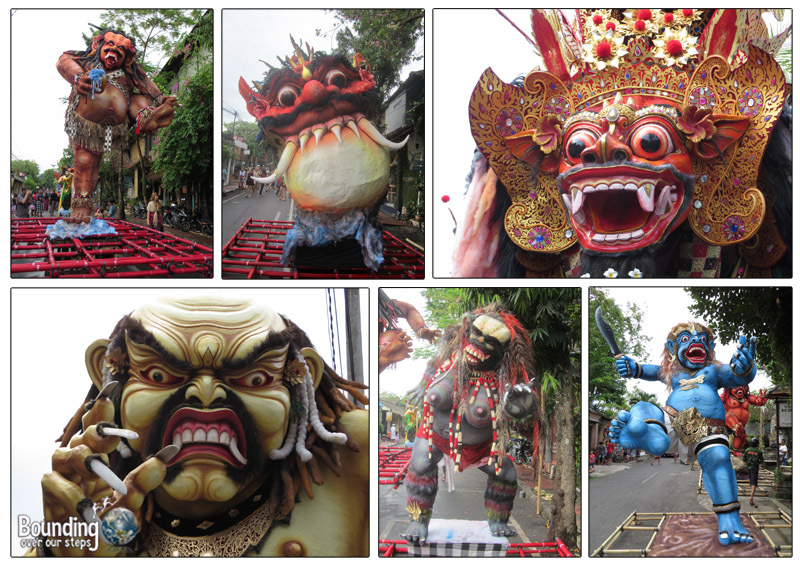 We rang in the year 1936 with the villagers of Ubud and very scary monsters called ogoh-ogoh, followed by a day of absolute silence. The Thai New Year, otherwise called Songkran, is not only our least favorite New Year event, but also our least favorite Thai holiday. Unfortunately, our travel plans were such that we were in Chiang Mai, which is reported as “the place to celebrate Songkran” in all the travel books. Songkran, Thailand’s biggest holiday, is celebrated in several ways, including making merit at a local temple, honoring the elderly and building sand castles. These traditional aspects to the holiday however have taken a back burner to the city-wide water fight lasting not one day, not two days, but five days! While at first we thought the idea of a big water fight sounded like fun, we quickly realized that this holiday seemed to bring out the worst in everyone, locals and tourists alike. People went out of their way to spray those passing by with either filthy water from Chiang Mai’s moat or freezing cold water that shocks you. They aim for the eyes, cameras and phones resulting in a hospital waiting room full of eye infections and body rashes, broken electronics and dead phones. So, this year we rang in 2557, hunkered down in our apartment, after learning our lesson from the year before. Where have you celebrated New Year’s? Balinese New Year sounds pretty interesting. 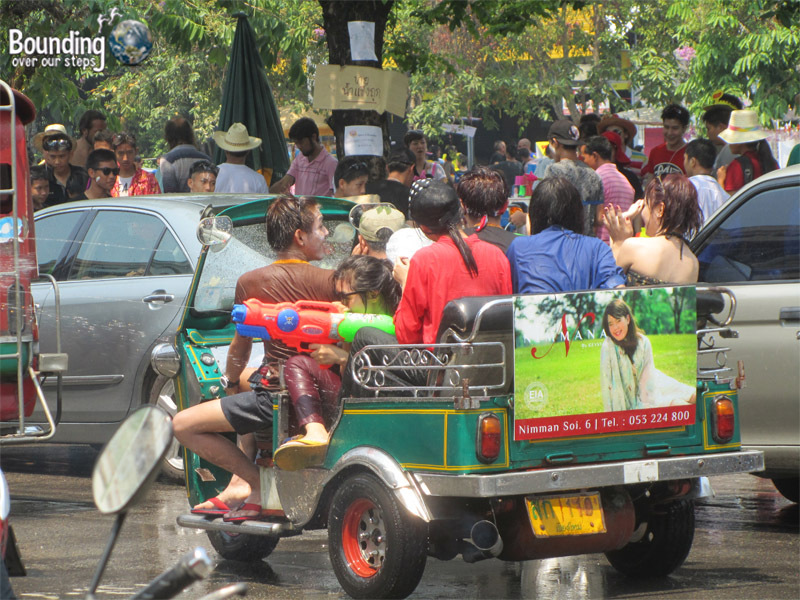 Ah, Songkran – it was a bit too crazy for me. Fun at first, but after 2 days I was a little too tired with the whole madness. But, had a good time anyway.